This trophy is donated by WAHO to those horses having achieved special results in the breeding barn or in sports competition. In each WAHAO member country one horse get this trophy. The "WAHO Trophy 2006" in Germany was awarded to the straight Egyptian stallion MAYSOUN (Ansata Halim Shah x Maysouna), bred and owned by Maiworm stud. 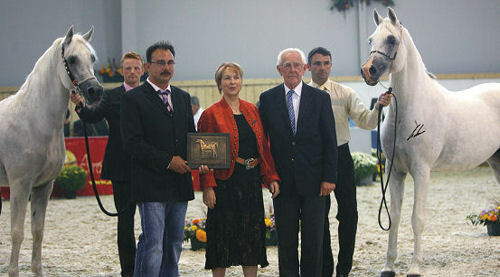 He is the only stallion in Germany who sired 8 sons, who were awarded a gold medal at the annual German Stallion Show. Unser Gestüt wurde 1978 gegründet. Inzwischen umfaßt es einen Bestand von ca. zehn Vollblutarabern rein ägyptischer Blutführung und die Familie der Tersker "Elitestute" Nesnakomka. Unsere Deckhengste sind der selbst gezogene Maysoun und sein Sohn Orashaan, zwei international anerkannte Beschäler. Die Pferde leben in hellen und luftigen Stallungen. 10 Hektar Weiden und viele Sandausläufe umgeben das Gestüt. Maiworm-Araber sind erfolgreich auf Schauen, viele unserer Pferde errangen in den vergangenen Jahren internationale Championatstitel. Einer der führenden rein ägyptischen Deckhengste der USA ist der auf unserem Gestüt geborene Orashan (Messaoud x Ora). Viele Söhne unseres Maysoun eroberten Schautitel in ganz Europa und wurden selbst zu hervorragenden Vererbern. Unser Zuchtziel ist der typvolle, korrekte Araber mit starkem Gangvermögen und - vor allem - mit einem liebenswerten, dem Menschen zugeneigten Charakter, leicht zu reiten und leistungsstark. Besuchen Sie uns, wenn Sie auf der Suche nach einem "arabischen Freund" sind! Our stud was founded in 1978. By now it consists of some ten purebred Arabians of straight Egyptian lines, plus the family of the "elite" mare from Tersk/Russia, Nesnakomka. Our herd sires are the homebred stallion Maysoun and his son Orashaan, both internationally acclaimed sires of successful get. 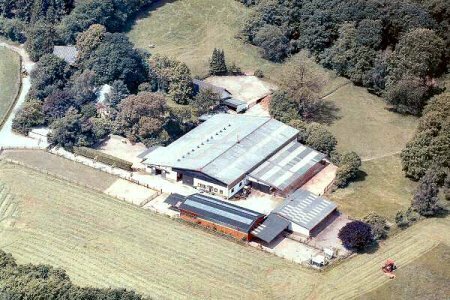 The horses are living in modern stables with plenty of light and air; the farm includes about 25 acres of pasture and many sand paddocks. Maiworm Arabian Stud is very successful at shows - many of our horses won international championships during the last years. One of the leading straight Egyptian stallions in the United States, Orashan (Messaoud x Ora), was foaled at our studfarm. Many sons of our beloved Maysoun conquered the European show rings and became respected breeding stallions in their own right. We aim to breed a typey, correct Arabian horse with plenty of action and - especially - a sweet, people-loving disposition. A horse that is easy to ride and willing to perform. Contact us to find your very special friend!